What's corn-y and works as a birthday cake? What's corn-y and works with homemade Coffee Butter Almond Ice Cream? How could we make something wonderful using some almond paste left over from the now distant year-end holidays? We asked these portentous questions as we prepared to celebrate the first birthday of our weekly Cornbread Suppers. Time to consult with Chef Google. Coffee Butter Almond Ice Cream made exactly by an equipment manufacturer's recipe, using fine Kentucky country milk, cream and butter. The instant espresso powder, organic sugar and almonds from "away" got married to the fine Kentucky country milk, cream, and butter, and lived happily forever after, which in the case of this ice cream amounted to about one hour flat. 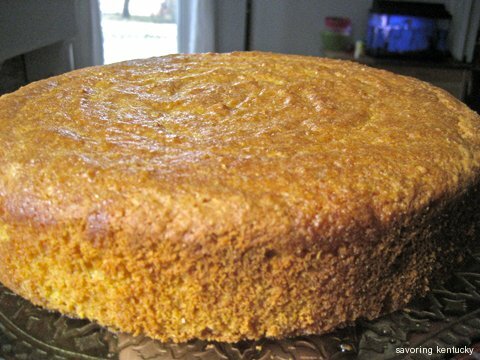 Almond Cornmeal Torte (photo above) that started out as a lovely Martha Stewart wedding pound cake recipe, complete with separately beaten egg yolks and whites, and ended up simplified as a sturdy batter that went directly from the food processor to the baking pan. Weisenberger cornmeal and flour, local eggs, butter, and sour cream from home paired happily with the almond paste, sugar and extracts from afar. And so Cornbread Suppers enters its second year of Corn, Conviviality, and Community, riding on a little boost of almond, Amaretto, and espresso. Kids grow up fast these days. What's a Win for Communities? Farmland or Developments?